Brushless dc motors have constant torque (after the initial startup rpm has been reached so the ESC knows the rotor position). 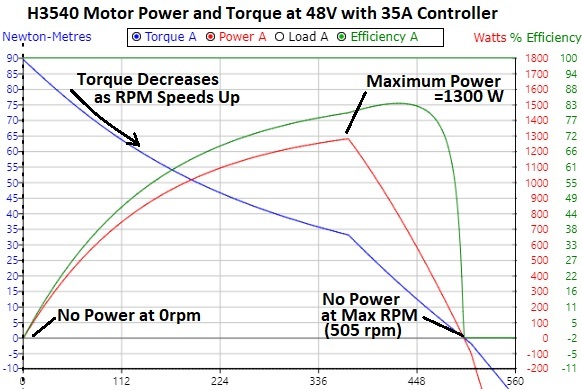 With rotational speed the voltage produced by the turning motor rises, if this generated voltage gets close to your battery voltage you can not drive the motor any faster. Thats why there is the trick called field weakening. Field weakening changes the timing of the current through your motor phase wires. Now not all current is used in the moment for optimal torque. Some of the current is used to weaken the field of the permanent magnets on your motor‘s rotor. This reduces the voltage produced by your turning motor. So your battery voltage is higher again and you can accelerate your motor further. This comes at the cost of less torque. You could also look at this as if the motors KV number was higher in this area. I think for most uses here you sould not need the field weakening/constant power area. 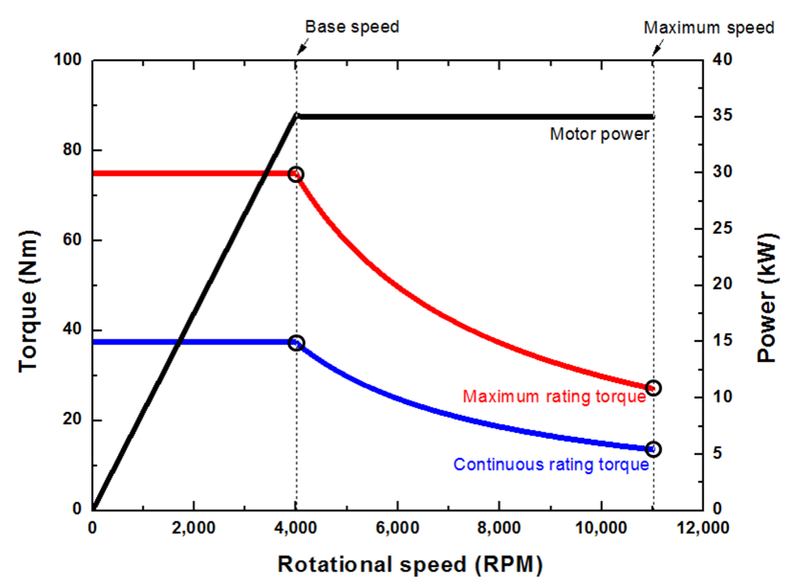 So basically bldc motors have constant torque and therefore power rises with rpm I‘m not even sure if most ESCs implement field weakening, except maybe for the timing parameters. Of course the numbers differ for every motor, but the form should always be the same. I would argue that your efoils design point should not be in the field weakening area.